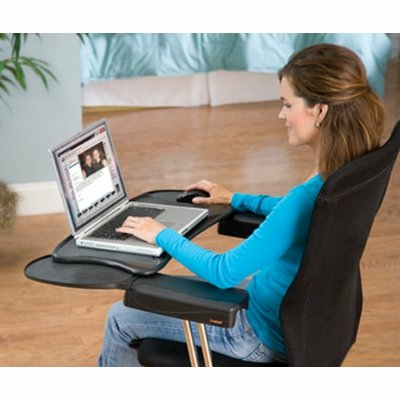 Say hello to the Mobo® chair mount ergonomic keyboard and mouse tray and goodbye to the painful stress and strain across your neck, back, shoulders and arms that results from everyday computer use. 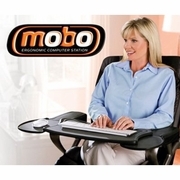 The Mobo is a revolutionary keyboard and mouse tray system that attaches directly to your existing chair. The Mobo's unique, patent pending design naturally positions both desktop and laptop computer users in a comfortable and healthy neutral body position. By placing the keyboard tray and mouse pad directly on your chair, the Mobo eliminates awkward reaching and stretching for computer controls and provides unsurpassed comfort and mobility. 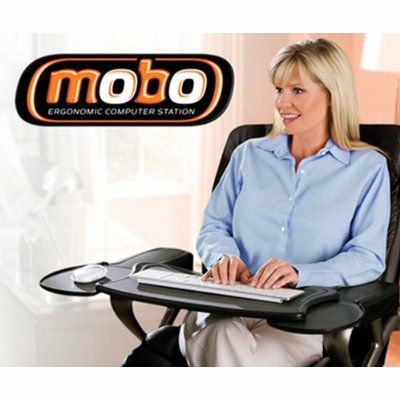 The Mobo's versatility, comfort and ergonomic benefits make it an ideal solution for virtually anyone who uses a computerperfect for business use, home office workspaces, dorm rooms, computer gaming, data entry, casual web surfing and more. Maintaining a healthy body posture has never been easier. 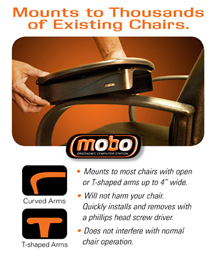 Maximize your comfort and protect your health with the Mobo. If you need replacement parts click here.